“Every union man in Seattle will walk out on a general strike at 10 a.m. next Thursday,” said a central labor committee. It was a “sympathetic move” to support 25,000 striking shipyard workers. A general strike would mean that tens of thousand of other workers would walk off the job, virtually paralyzing the city. “Plans are being perfected to feed the strikers and the general public,” said a labor spokesman. 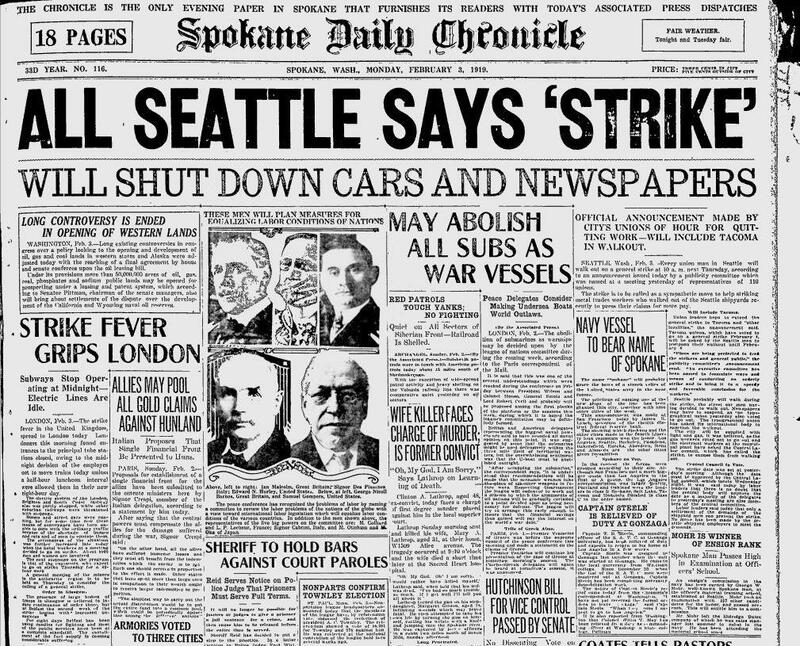 Union leaders hoped to expand the general strike to Tacoma. Earlier, there had been talk of expanding it to other cities, including Spokane, but there were as yet no plans to do so. From the murder beat: Clinton A. Lathrop, 48, was charged with murder for shooting his wife in their Spokane home and then turning the gun on his stepdaughter, 14, inflicting serious wounds. Then he tried to take his own life, by shooting himself. The bullet pierced his lung, but did not kill him. He then staggered to the Spokane River and jumped in. He eventually climbed out and hid in an outhouse, where police found him after an eight-hour manhunt. He had also attempted to cut his wrists. His stepdaughter was still in “very serious” condition at Sacred Heart. Lathrop was being treated for his own wounds and for exposure, but he was expected to recover. He and his wife had been in the midst of a divorce battle. Before he shot her, he said, “No court in the world will settle our troubles.” He shot the stepdaughter because, he claimed, “she had a knife or something.” She told police that he pursued her to the pantry and fired a third shot. Published: Feb. 2, 2019, 11 p.m.